Product Description: A regular-duty, cold-rolled, medium steel strapping. Manufactured with superior edge conditioning and coating. Product Description: Magnus is a cold-rolled, heat treated, medium carbon steel strapping that provides high tensile strength and excellent shock resistance. Product Description: Contrax is a smooth, split resistant strap that is a good choice for light and medium duty applications. Product Description: Ensures reliable securing of your products with low camber for all applications. Product Description: Strap available from 1/2" to 1" wide, and in various thickness to meet your load requirements. Polyester is a great alternative to steel banding, as it maintains strength while decreasing rust and damage on forklifts and other in house equipment. Product Description: Tenax polyester strapping provides great load stability during storage and shipping, and is compatible with a variety of Signode plastic strapping tools and machinery. Product Description: Design allows use for plastic or steel strap cutting. Capable of cutting through strap of any size or width. Cuts strap through 2" x .050. 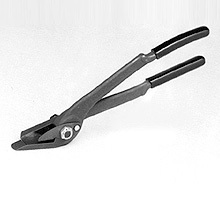 Product Description: Top quality, rugged steel and plastic strap cutters. Cuts strap through 1 1/4" x .035. 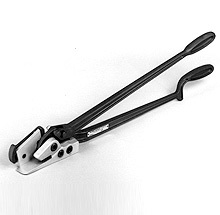 Product Description: Ergonomic cutter for steel and plastic strapping with a new design that protect's operator's hand. Cuts strapping up to 3/4 x .031". Product Description: New safety first design, like CY 29. 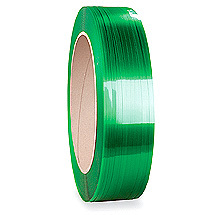 Designed to cut steel or plastic strapping up to 1-1/4 x .035". 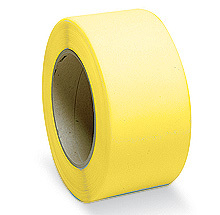 Product Description: Made for severe impact applications using waxed strapping. These seals have maximum holding power. Product Description: Held together by interlocking nibs. Used in combination tools where dozens of seals can be loaded in one quick motion. Commonly used with Apex Steel Strap. Product Description: Heavy-duty snap on seal that eliminates pre-threading to ease and speed operation. Product Description: Used where strap is tensioned by butting the nose of the tensioner against the seal. Designed for use on irregular bundles to withstand higher stress. Product Description: Open seals are easily placed over the overlapping strap ends either during or after tensioning the strapping. Product Description: Must be threaded over the overlapping strap ends before tensioning tool is applied. Used on bales, bundles and larger strap sizes. Product Description: Easily loaded with mill wound steel coils or 16" x 6" plastic coils. Built to last in any shipping room. 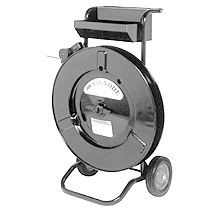 Product Description: Accepts mill wound or ribbon wound coils 3/4"- 1 1/4" in width. Built to last. Product Description: Tool balancers are the most effective way to suspend strapping tools from a fixed ceiling bracket, monorail, jib or bridge clean.